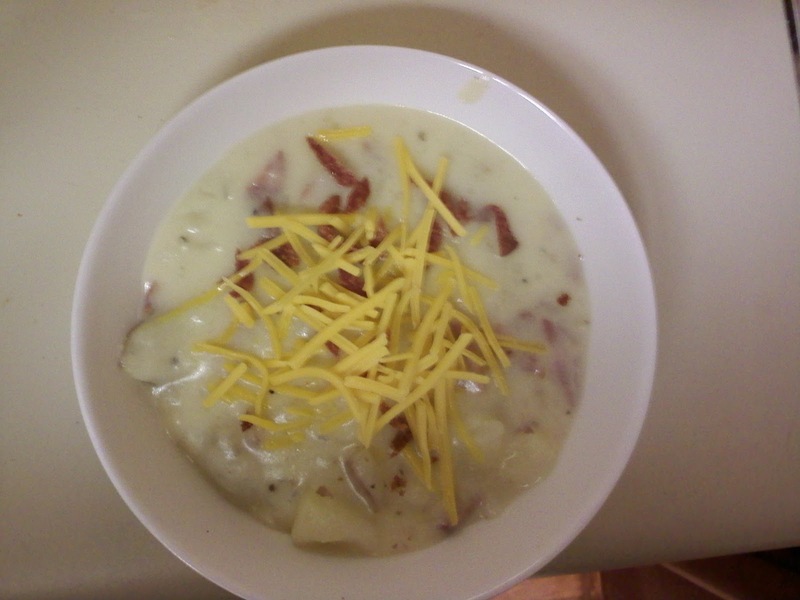 I mentioned potato soup to my trainer - and even though this recipe is from Cooking Light - it did not get his approval because of the potatoes. It turned out well and I will definitely make it again...even if it does get circled in my food journal. The recipe is in the 'super fast' section to be made in 20 minutes, but I let it simmer on the stove for a bit after adding the potatoes and sour cream. I also doubled the recipe from what was in the magazine. The recipe below is the original from the magazine. Pierce potatoes with a fork. Microwave on high 13 minutes until tender. Cut in half, cool slightly. While the potatoes cook, head oil in a saucepan over medium-high heat. Add onion, saute 3 minutes. Add broth. Combine flour and 1/2 cup milk, add to pan with 1 1/2 cups milk. Bring to a boil; stir often. Cook 1 minute. Remove from heat; stir in sour cream, salt, and pepper. Arrange bacon on a paper towel on a plate in the microwave. Cover with a paper towel; microwave on high for 4 minutes then crumble bacon.